This particular door has the following specification. One door is supplied. Size selected from the drop down menu. All the doors are 1¾" (44mm) thick. Unfinished, needs treating with coats of an high build stain or paint. On quantities of 5 or more doors, please contact us for further delivery options. 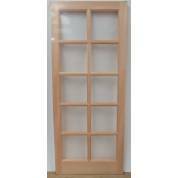 This door is not suitable for clear varnish, waxes, oils, polishes or lacquers as these do not fully protect the door. Use of these product types will invalidate the warranty. The door will have comprehensive fitting and/or treatment instructions within the packaging that must be followed. If for some reason your door does not contain these, please request them before commencing any fitting or treating of your door. This door is a new unopened item, still in the manufacturers packaging, but is clearance stock from a leading supplier. This means that once this stock has gone, we may not be able to source them again. 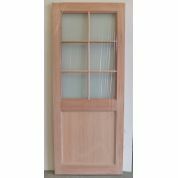 Engineered Oak Pablo External Panel Door Wooden Timber Paint Grade 78x33"